Thought Elevators review: it’s a complete meditation program good for beginners but maybe not good for intermediate people. Not the best choice, but still good. VERDICT: Thought Elevators is a good program if you’ve never tried visual meditation. Meditation using tools helps you enjoy the process and improves the effectiveness of your meditation. The 3-minute videos and 30-minute audios are good quality and you can choose which area of your life you want to improve. You can feel a boost in your mood and mental alertness if you meditate using the videos and audios regularly. Over time, you can experience a difference in your life. However, it’s not the only option available. There are other visual meditation videos and audios you can find, even for free on YouTube. A similar program that comes to mind is Mind Movies that allows you to customize a visual meditation video (but the program is more expensive). You can meditate using YouTube videos, but they are random. Thought Elevators provides a consistent curriculum you can follow. Why Should You Try Thought Elevators? One of the tools we can use to help us have satisfying days is meditation. Meditation helps us to focus our emotional and mental energy before we start to do work. But meditation can be difficult to do if you have many things on your mind. Therefore, meditation using video or audio is an option we can choose to improve the effectiveness of it and help us enjoy the process. Meditation using video or audio relies on brainwave entrainment. Brainwave entrainment is a process where we listen to sounds with a certain frequency to bring our brain to that frequency. The effect is that our brain becomes relaxed and we can access the creativity we need to solve problems. Thought Elevators is a program that gives you meditation videos and audios that contain beneficial brainwaves. Thought Elevators is a set of meditation videos and audios that each focus on a specific topic. Each video is three minutes long and each audio is thirty minutes long. The videos show a slideshow of positive images with reinforcing words (affirmations). The audios are only meditation sounds that contain certain brainwave frequencies without any spoken words. The topics that this program covers are: accelerated learning, anxiety and stress, business success, energy, ideal partner, ideal weight, perfect health and healing, relationships, wealth and money. Each topic has one meditation video and one meditation audio. You can begin with the topic that is most urgent in your life right now, or begin with the first topic and work your way through the list. 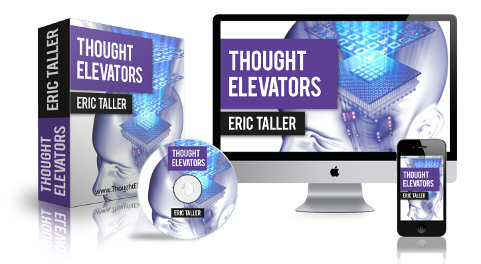 Other than the videos and audios, you also get the Thought Elevators Quickstart Guide e-book that explains how the program works and the Achieve Your Goals Masterclass e-book that helps you get to your goals. There are also seven bonus e-books about various topics that supplement the program. The program is made by Eric Taller, who seems to be a pen name of the real author. I can’t find any information about this name other than the fact that he is the author of Thought Elevators. Using a pseudonym is fine but I prefer a program that is made by a person who has a real-life presence (an example would be Bob Proctor, John Assaraf, and others). How Does Thought Elevators Work? The meditation videos and audios use theta frequency brainwave entrainment (using binaural beats) and affirmations. The theta frequency brainwave is thought to help access our inner creative abilities. This inner creative ability is what we use to solve the problems we face and improve the quality of our life. The video meditations have written affirmations on each image. The affirmations are positive and uplifting, such as the one in the Wealth and Money video: “as my commitment to help others grow, so does my wealth”. I admit watching the videos and speaking the affirmations does boost my mood and make me ready to do the work today. The program doesn’t say precisely how to watch and listen to the meditation videos and audios. I found out that you first watch the videos and then move on to listening to the audios. The videos are short and easy to watch even on a busy schedule. Once you can meditate consistently, listen to the audios that are long and may require a dedicated slot of time in your day. #1 There Are Many Topics – But Maybe Too Many? Thought Elevators is a good program if it’s your first guided meditation using brainwave entrainment and affirmations. There are many topics that the program covers so you can choose one that is most important to you. On one side, I feel that this assortment of topics means many people can relate and use the meditation videos and audios. On the other side, I feel that many topics means the program doesn’t have a focus and therefore doesn’t offer in-depth help for a single topic, such as wealth and money that may be urgent for many people. #2 Good Video and Audio Meditation – But Not the Best? The video and audio meditations are enough to get you started and last a while. You can feel a change once you start to regularly meditate along with the videos and audios. But there are other options that also offer you video and audio meditation. Mind Movies is a program that allows you to customize a video meditation with images and text of your choice. You can also go to YouTube and find many guided meditations that use brainwave frequencies. 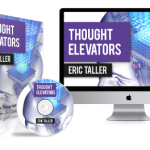 The reason to buy Thought Elevators is if you want a program good for beginners and at a fair price with a done for you curriculum. I think Thought Elevators is OK but not the best program. There are better options than this program that you can choose although they may be more expensive. You can go to YouTube to try out guided meditation to see if it fits you or not. But if you know you want video and audio meditations that you can simply play and follow, and you want a complete program that covers all topics, then Thought Elevators is a good choice for you.